The GOCM site was technically my first Expression Engine site developed; however since finishing the design and development phase and then having the GOCM staff focus on the content editing, I have developed and completed at least five other Expression Engine sites. Yes, I can hear you - I will showcase them too in a few days. This site uses several new technologies to me, at the time. I integrated Slide Show Pro (SSP) with XML, Adobe Spry drop down lists (an AJAX framework), and the new love of my life - Expression Engine (EE). 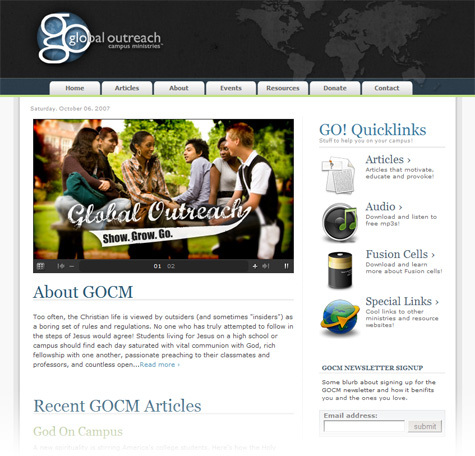 The challenging part was the shear size of the GOCM website as well as the incredible flexibility of EE. EE is such a flexible CMS, it was difficult to harness its potency where I needed it when I needed it; A typical newbie trait. But when I got used to its versatility, you couldn’t stop me!